Focal-length determines the angle-of-view seen through a lens for a given sensor-size. With a full-frame sensor a lens gives the same angle-of-view as it would on a 35mm film camera. With a smaller sensor, the angle-of-view becomes smaller. The crop-factor, also called FLM, is the ratio representing the difference in equivalent focal-lengths. So a 150mm on a full-frame DSLR such as the Nikon D700 gives the same angle-of-view as a 100mm on a D7000 since its FLM is 1.5X. In layman's terms, what is angle-of-view? Is it the same as focal length? If not, how is it different? How is it used? Why do I need to know about it? In layman's terms (assuming a layman who knows some very basic geometry), imagine your nose as the point of a triangle. The left side of the triangle is the left edge of your peripheral vision, and the right side is the right edge. The horizontal angle of view is simply the angle between those edges, and the vertical angle of view is the same thing for up and down. For a human eye, the angle of view happens to be about 95°, but since your eyes move around unconsciously and your brain fills in the details, it feels much wider than that. Draw a line 23.6mm long — the width of the sensor in your D7000 (and many similar cameras) — in the center at the bottom of a blank piece of paper. You can just look at the images I've made below, but if you're a hands-on learner like I am, it's really useful to actually get out some real paper, colored pencils, and a ruler, and follow along in the physical world. Measure from your sensor along the center line you just drew. Put a dot at 35mm. Label this "35mm lens". This represents the pinhole aperture of an idealized 35mm lens. With your straightedge, draw a line from the left edge of your sensor line through the 35mm aperture dot, and continue all the way through and on to the edge of the page. Then do the same thing from the right edge of the sensor line. This should produce a big X shape. Label both lines of the top cone of the X "35mm field of view". Do the same thing with the 50mm lens dot. Label this, of course, "50mm field of view". Now, you can directly see that a shorter focal length produces a wider field of view. Anything that's within those lines will be in your picture, and everything outside will be out of frame. Note that the lens may project a much wider cone of light that doesn't all fall on the sensor — the lines you drew ignore that, since light that isn't recorded doesn't really matter. If you measure the angle, you should see that it's about 36.5° for the 35mm lens, and about 26° for the 50mm lens. Experiment one: Choose some different focal lengths (15mm, 200mm) and see what those give you. Experiment 2: Increase the size of the sensor line to 36mm, as in Nikon's "FX" full-frame cameras. Keep the line centered on the same dot, of course. Use your same lens dots but draw new X lines to the larger left and right edge of the sensor. It's immediately apparent that including this extra part of the light cone makes the recorded field of view of the same focal length much wider. Notice that the 35mm on your D7000 gives roughly the field of view of the 50mm on FX — this is why people talk about "equivalent" lenses. This neatly (I hope) answers the question of the relationship between focal length and angle of view / field of view, and also explains the effect of different sensor sizes — and, as a bonus, shows how cropping is interchangeable with zooming (if you don't mind using less of your sensor). Focal length is the property of lens. Angle of view is what actually matters in practice, lens focal length is just more convenient to use as an equivalent value when frame size is fixed and well-known (like the standard 35mm frame). As a logical consequence, these days sensor size is usually mentioned together with lens focal length in order to get understanding of the angle of view used. The last thing asked in the query was why should we care about this. Let me answer that with an example. I've been trying to decide if getting a 20mm lens for my 1.5 crop factor camera would make sense in light of the fact I've already got a 24mm. Here are the numbers (from an on line calculator). On the Dx body the 24 gives you 53.1 horizontal, 36.9 vertical, and 63 degrees diagonal. The 20 provides 61.9, 43.6, and 71.6, respectively. But when you look at what's in the frame of a picture those numbers add up. 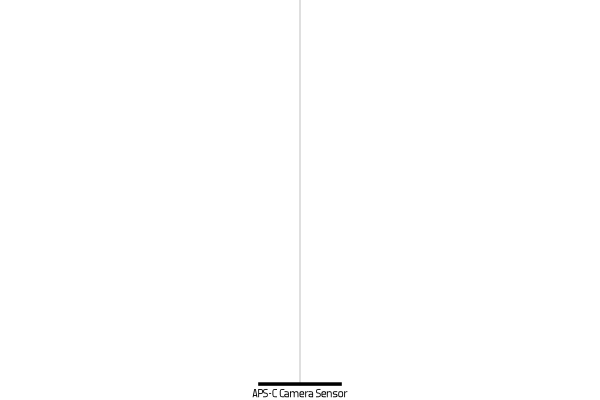 At 10 feet from the sensor, the 24 encompasses an area of 10 feet by 6.7 feet or 67 square feet. The 20mm frames 96 square feet (12x8) at that same distance. At 20 feet the difference in what's within the frame is 118 square feet (266 v 384). The 20mm lens thus encompasses 44.4 % more ground within its frame at 20 feet than the 24mm. Still, if you can back up 2 feet from the 10 foot subject, increasing the subject to sensor distance to 12 feet, the exact same field of view is available with the 24mm as at 10 feet with the 20mm. At 20 feet, you'd have to back up 4 feet. So, in the situations you shoot, are those one or two steps backwards something you can take (keeping in mind that changing the distance to your subject changes perspective as well)? The angle of view is related to the focal length, and the size of the sensor in use. So, for a 50mm lens on a 35mm sized sensor (or film), you'd have a field of view of 46° on the diagonal. As the focal length doubles, the field of view halves, so a 100mm lens on a 35mm camera has a field of view of 24° on the diagonal. If you use a smaller sensor, you're effectively cropping the image down, so whilst the lens may produce an image good enough for a 35mm frame, a smaller sensor will ignore the parts that fall off the edge. This crop factor divides the angle of view, so that 50mm lens would have a field of view of about 31° on the diagonal if you were using an APS-C sized sensor. Alternately, and how most people think about it is the equivalent focal length, had you been using 35mm, which would be case of multiplying the real focal length by your crop factor, so that 50mm lens on a D7000 is equivalent to a 75mm lens on a 35mm camera. Angle of view is actually three different angles (diagonal, horizontal/landscape, and vertical/portrait), each of which is the measure of the angle at the top of an equilateral triangle measured from the focal point of the lens (where all the light rays cross) and spanning from the farthest points (corner-to-corner, left-to-right, or top-to-bottom) across a plane that is parallel with the plane of the focal plane. 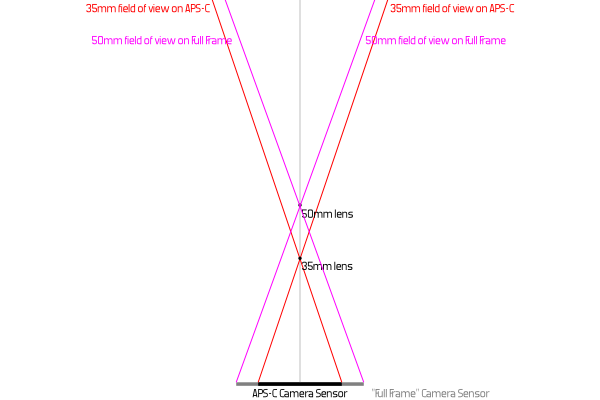 Note that the focal plane is not always parallel with the plane of the camera's back (film/sensor), nor is it always flat: tilt-shift lenses move the focal plane out of parallel with the back, so the angle of view does not necessarily tell you what will be in focus, and some lenses have blurry corners because of how the focal plane is mapped onto a bowl-shaped (or even more complexly-shaped) manifold. As a result of this, typical AoV calculations are best regarded as a close approximation, especially with wide-angle lenses. As the correct answer post mentions, the AoV is relative to the size of the capture area at the camera's back. 35mm film was the standard for 50 years or so, and as a result, people associate certain angles with the focal length used to achieve them on 35mm film cameras. Initially, consumer digital interchangeable lens cameras (like DSLRs) used smaller formats of sensor, and people used a "focal length multiplier" to calculate the "equivalent 35mm format focal length". 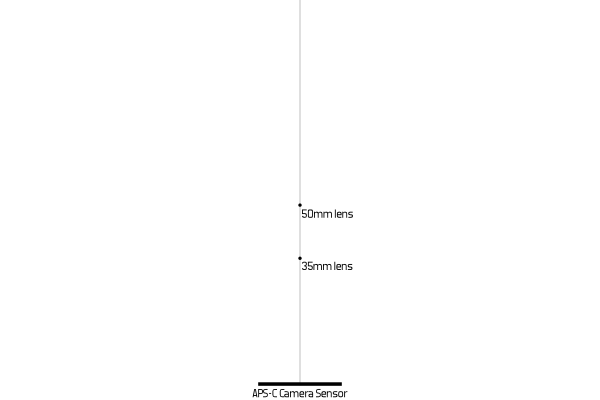 For example, so-called "APS-C" format sensors from Canon, for example, the focal length multiplier was 1.6. 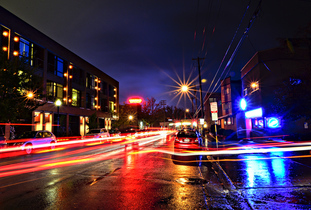 On the DPReview.com forums, in the early 2000s, a debate raged about this because the focal length also affects depth of field properties, and people therefore thought that because the focal length multiplier changed the focal length, it would change other properties like depth of field, not just the angle of view. However, the sensor size being smaller only makes the angle smaller, but does not affect the depth of field or other properties. Therefore one person suggested that, instead of using the phrase "focal length multiplier," that instead, the phrase "crop factor" be used, so people would understand that the image is the same, just with a smaller angle of view, as if a photograph had been cropped. The initial suggestion for "crop factor" was to use a percentage equivalent to the inverse of the focal length multiplier (e.g. 1/1.6, for APS-C, 62.5% of the pre-crop image gets cropped out), since cropping is a reduction and should therefore be expressed as a percentage less than 100%. However because the point of the figure is to make math easy to do in your head, and it's easier to multiply by 1.6 than it is to divide by 0.625, the industry kept using the focal length multiplier, and just renamed it "crop factor." Today with the prevalence of smartphones, it is convenient to use an app to calculate the actual angle of view and distance to subject, and also to visualize the sensor sizes, compute crop factors and equivalent focal lengths, etc. There is a good iOS app called "Angle of View" that lets you see the three angles of view that you would get from a given focal length of lens on a given sensor size—and what that is equivalent to on four other sensor sizes. It also draws the five sensor sizes to scale, tells you the distance across your shot at a given distance-to-subject, and makes adjustments based on the aspect ratio you're shooting at (like if you're using square mode on your camera). Here is a web link to the developer's page. The angle of view is a measurement of the view plane area of an optical system in arc degree. Not the answer you're looking for? Browse other questions tagged lens focal-length sensor-size field-of-view crop-factor or ask your own question. 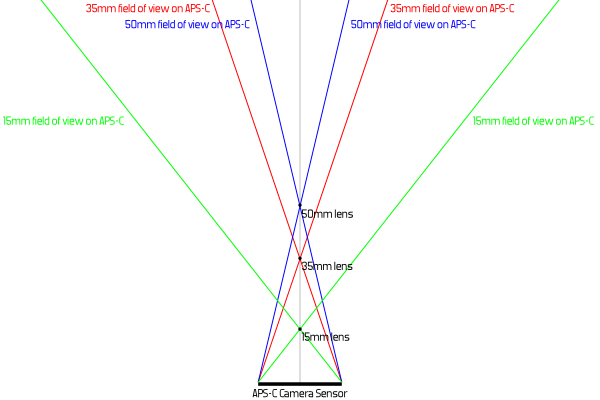 Field of view using 50mm APS-C lens on APS-C body vs 50mm FF lens on FF body? Why does the angle of view narrow as you zoom in? How can lenses with different focal lengths have the same angle of view?